US Targets Turkish Officials for Sanctions Over Pastor's Detention - Integration Through Media ....! (VOA): Turkey says it strongly protests the decision by the United States to impose sanctions on two of its government officials over the detention of a U.S. pastor accused of aiding terrorists. The statement late Wednesday followed an announcement by the U.S. Treasury Department that it has targeted two Turkish government officials for sanctions following Turkey's refusal to release U.S. Pastor Andrew Brunson from house arrest ahead of his trial. The Treasury statement said Gul and Soylu played leading roles in the organizations responsible for Brunson's arrest and detention over the past 21 months. On Tuesday, a Turkish court rejected an appeal for Brunson to be released from house arrest while awaiting trial. Brunson is next expected in court October 12 to defend against charges of helping a network led by U.S.-based Muslim preacher Fethullah Gulen, which Turkey blames for a failed 2016 coup against Erdogan. Brunson is also charged with supporting the outlawed Kurdistan Workers' Party (PKK). The 50-year-old pastor, who denies the charges, could face up to 35 years in prison if convicted. 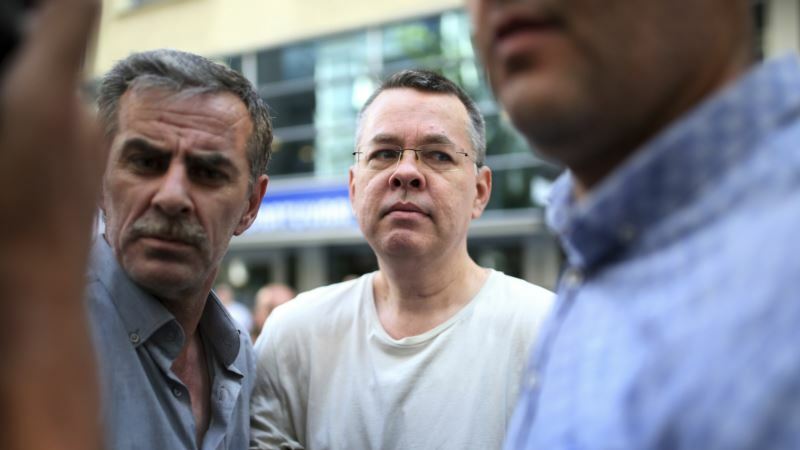 The detention of Brunson, an evangelical pastor from Black Mountain, North Carolina, has strained relations between Turkey and the U.S., both NATO allies. Brunson is among tens of thousands of people Erdogan detained on similar charges during the state of emergency he declared following the failed coup in 2016. The state of emergency ended July 18, but the Turkish legislature passed a new “anti-terror” law last week that gives authorities more power to detain suspects and restore public order.